Preheat oven to 375°F. Butter a 2 1/2-quart casserole dish and set aside. Stir pasta from both boxes into a large saucepan of boiling water. Cook uncovered for 6 to 7 minutes (2 to 3 minutes less than noted on the box), until al dente. Drain the pasta and return to the saucepan. Stir in packets of cheese mix from both boxes, 8 tablespoons of butter and 1/2 cup of milk. Stir in the thawed broccoli, tuna and additional 1/2 cup of milk. Pour into the prepared casserole dish. Place the Bugles™ in a zip-top bag and seal. Crush the Bugles™ with a rolling pin or mallet. Melt 2 tablespoons of butter in a microwave-safe bowl. Mix the butter with the crushed Bugles™ and sprinkle mixture on top of the casserole. Cover the casserole with foil and bake until the sides are bubbly and the casserole is heated through, about 20 to 25 minutes. Uncover and broil on high until lightly browned, about two minutes. Let sit for 5 minutes to cool. 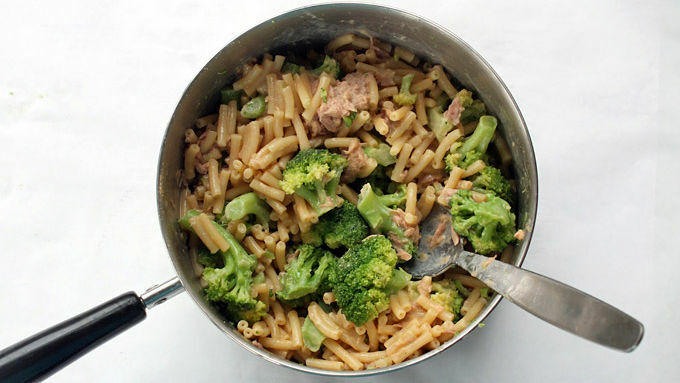 Just when mac and cheese couldn't get any better, here's a version with tuna, broccoli and the crunchiest topping ever. 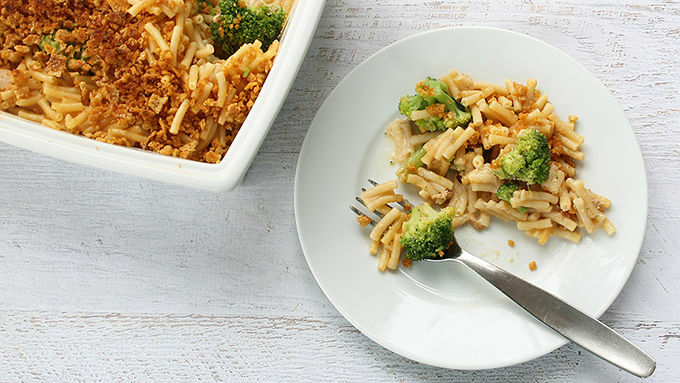 Bugles™ corn chips are the secret to the crunch in this easy macaroni dish! I have an unrivaled passion for mac and cheese. From scratch, a box, a bag, my mom… it doesn’t matter. From the diner down the street or that fancy place in New York. From the stove top, from the oven, from a roux or from a mix – I love it all. So I consider myself quite the mac and cheese expert. 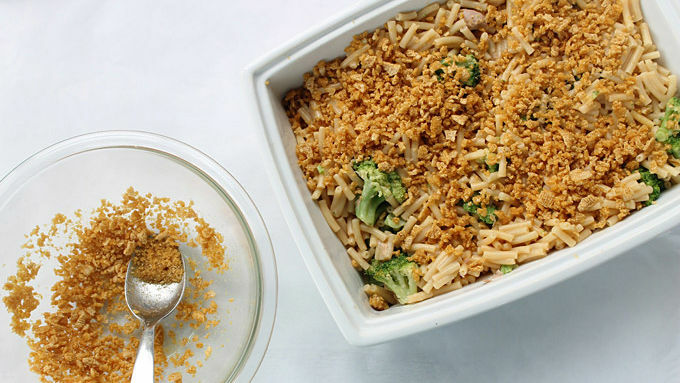 And as an expert, I can tell you how much I love this all-in-one mac and cheese casserole recipe! 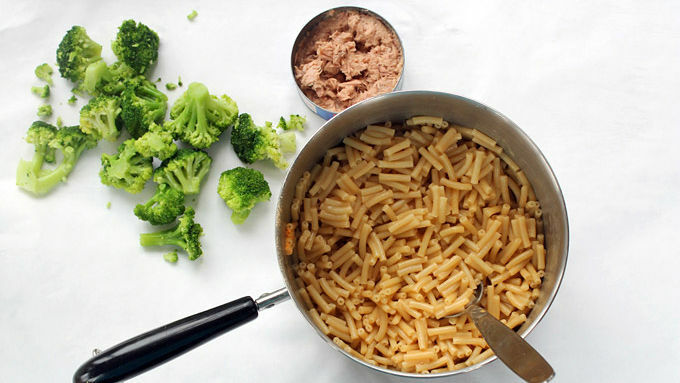 If your craving is as relentless as mine, here’s a quick way to turn a couple boxes of mac and cheese into a complete meal with a couple of quick twists. And it’s versatile. If broccoli isn’t your thing, choose a bag of peas and carrots instead. If tuna isn’t your thing, add some rotisserie chicken or cooked ham. I added a crushed Bugles™ topping. It turns out they're are the perfect topping for mac and cheese! Let sit for 5 minutes after baking, then serve and enjoy!